When many of the great rock songs were written in the ’60s, writers would hack out a song in an hour or two. For example, “A Hard Day’s Night” was written by John Lennon overnight. The next morning it was done and ready to record in a few hours. 1. Start with a great hit song. 2. If you can’t find a hit song in your bag, use any song sketch that you’ve got. Or cover somebody else’s song. You’ll learn if you force yourself to dig, and be creative. Remember—even the great songwriters write a stinker sometimes, but keep pushing. 3. Get a good computer (Mac is my preference, but many successful writers make brilliant music on PCs too) and sequencer/DAW program. Learn the programs thoroughly. If you are having a problem with a program, look up a solution on YouTube. Chances are some geek has posted an answer, and can show you how things work without reading the manual. You don’t need a lot of fancy hardware. I use only two mics for demos, an SM57 for guitars and a RØDE condenser for vocals. Most everything can be done with a direct box, or with plug-ins in the sequencer. My recording program is MOTU Digital Performer, I’ve been using it for years; occasionally I’ll use Pro Tools, and have started using Logic too. 4. Demo the song. Work quickly. Get up early. Shut off all emails, Facebooks, don’t answer the phone—let the answering machine pick up all calls. Don’t watch the morning news, or check the weather. Make coffee. First, record a Guide Demo to a click if you can—mono or stereo, it doesn’t matter— with just simple piano chords, or acoustic guitar chords. Don’t be fussy. Just throw an open mic in the room and wail away. Don’t fix any wrong notes or out-oftuneness, the cruder the better. 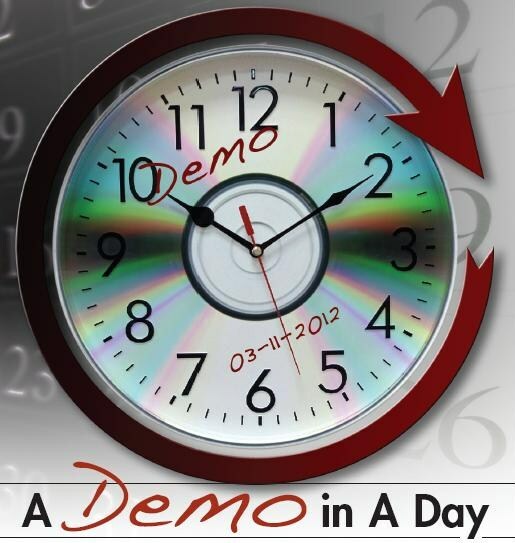 This Guide Demo will force you to stay focused to get you to the finished “Demo in a Day”. Put the Guide Demo in the top track of your sequencer. You will be turning this on and off as you work on your “Demo in a Day”. Add markers at the top of your sequencer that mark the intro, verses, choruses, any bridge, and the ending. Now do a rough drum track. I use Toontrack Superior Drummer; the sounds are very realistic and I have hundreds of MIDI drum files that give me any style I might want. I even bought other drum MIDI files from a company called Groove Monkee. They all work seamlessly with Digital Performer. Making drum parts is only a matter of drag and drop from the Groove section of the plugin to a MIDI track that is assigned to the Superior Drummer instrument. Use markers to vary the drum parts as a real drummer would. Add fills either a bar or two bars before each new section. It’s easy to see on the screen when a new section is coming. Usually the drum feel is the hardest to nail, so try different parts until you are happy with the feel and how it expresses the feeling in the Guide Demo. Be patient, this could take up most of your morning. Break for lunch when you’ve got the drum part programmed. parts. Percussion can help too. Bass parts you can do last, or first—it’s up to you. Don’t spend a lot of time on fixing little things. Loop a part if you stumble in the 2nd verse, or 2nd chorus. Sing a rough vocal. Add harmonies. Double the harmonies. Replace the rough vocal with a better vocal. I don’t like Auto- Tune, but I might use the tiniest amount on a rough spot. All the time I am recording, I’m reaching for plug-ins that do my eq, compression, and reverb. If I need to automate part of the mix, I’m doing that as I’m recording. Break for dinner. After dinner, mix it down. It shouldn’t take too long to get something reasonable, since you’ve already set up eq and compression as you were recording. When you get a mix, load in onto your MP3 player. Take a short drive in your car and test the mix. I always do the “car test” for mixes. Remix until satisfied. By now it’s about 10 PM. Do you know where your song is? It should be mixed and presentable to your friends, relatives and the rest of the band. I’ve spent months working on certain song demos. In the end, with that style of recording the results are mixed at best. The “Demo in a Day” technique works better. By forcing yourself to work quickly it’s easier to keep zeroed in on the emotional focus of your song. By the end of the day you will hear whether the song is going to be great or not. If it isn’t, don’t sweat it, you’ve only invested one day of your time; tomorrow you can go on to a new song. The perfect song is waiting around the corner. Joe Bouchard is a singer, songwriter, and bass player who has worked with his brother Al in bands like Blue Öyster Cult— he was first interviewed in our October 2011 issue. To learn more about his music, visit www.bluecoupeband.com.